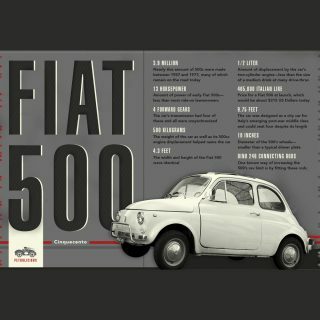 Now that Fiat’s back in the US for the first time since 1984, their near thirty-year absence from these shores ended with 2011’s arrival of the nuevo, Nuevo 500. 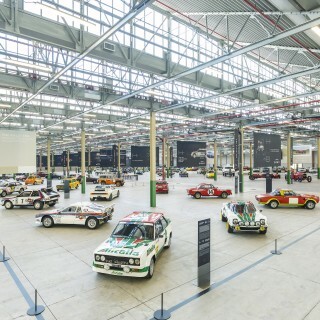 While the triumphant American return of Europe’s greatest automotive empire should be cause for celebration, for test drives, even for loans and paperwork, that sadly hasn’t been the case so far. Though Turin’s clearly been busy over the past three decades learning how to make cars run for several consecutive blocks without breakdown, sourcing steel from slightly more reputable purveyors, and studying American cupholder design preferences, it seems in the process they may have forgotten where they put their spark—that magic, unquantifiable, manic energy that their cars use to positively fizz with. 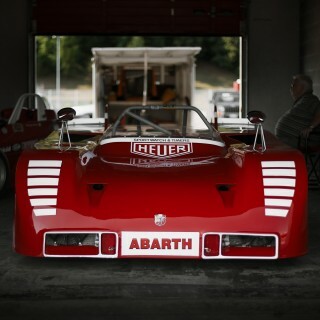 Fortunately, Abarth’s back again, too, and their retro 500 is an absolute riot to drive. So where did Abarth come from, and how did their distinctive scorpion badge come to be synonymous with all things fast Fiat? 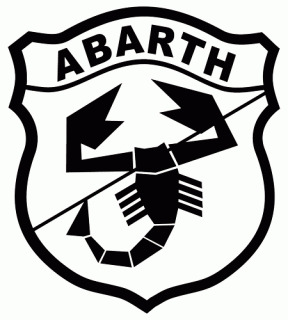 Karl Alberto Abarth was born in Vienna, Austria, on November 15th, 1908, under the astrological sign of the Scorpio, hence the famous logo. 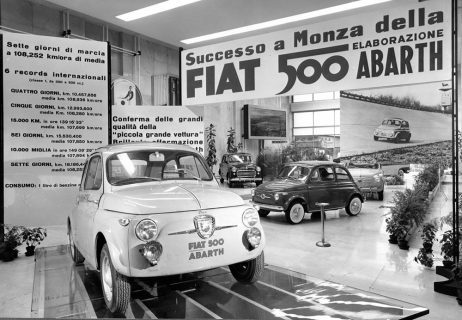 From a very young age it was clear that Abarth was gifted from birth with an innate understanding of engineering, and by 16 he was apprenticing in Italy where he was tasked with designing bicycle and motorcycle chassis for a long-defunct make. 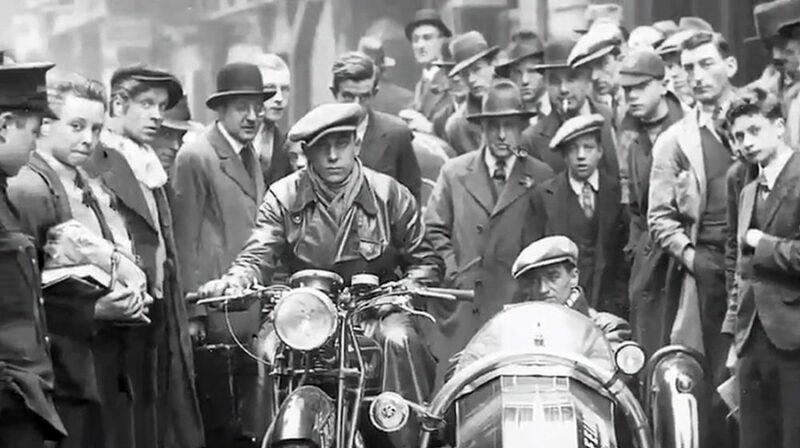 The remainder of the 1920s saw young Karl preparing and test riding race bikes for an Austrian firm, and eventually building his own machines bearing the Abarth name—by his mid-twenties, he’d become five-time European champion. Throughout the 1930s Abarth continued to race bikes, but after a few life-threatening accidents, the last of which saw him hospitalized for more than a year, he decided to permanently withdraw from motorcycle racing. 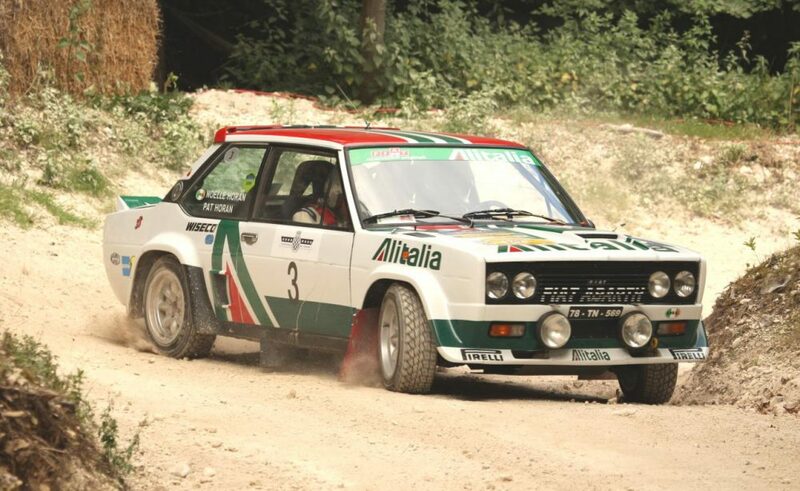 The next decade saw Karl relocate to Italy, where he had his name changed to a more local-sounding “Carlo”. 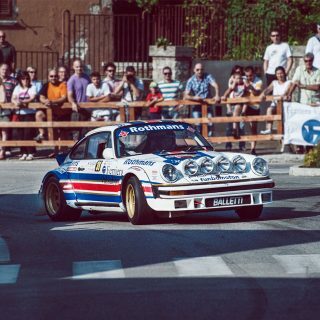 As official Italian head of Porsche’s design studio, it was during this time he worked on the legendary Porsche/Cisitalia 360, an all-wheel drive GP car featuring a mid-mounted, twin-supercharged 1,493 cc flat twelve producing in excess of 300 HP. Unfortunately, the car’s high development costs forced Cisitalia into receivership in 1949, the 360 never to turn a wheel in anger. 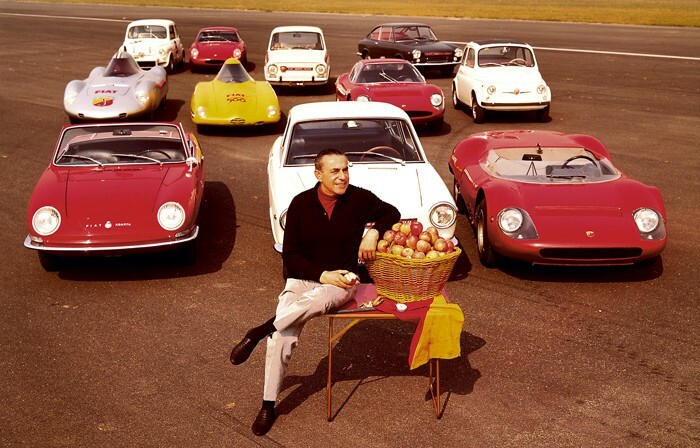 Carlo, having never received payment for his involvement with the project, founded Abarth & C. SrL on the back of Cisitalia’s remains on March 31st, 1949. 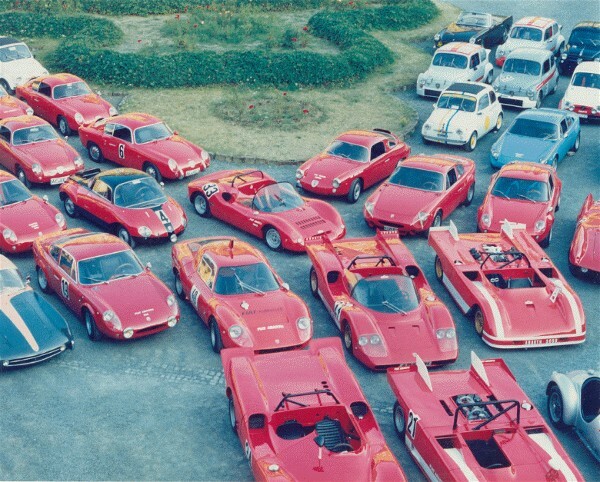 Their stated purpose was “the production of cars and complementary aggregates for sport and racing cars, as well as changes and improvements to sports and racing cars, servicing, manufacture of mass-production tools, agency services and the sale of fuels for race cars.”—perhaps the driest, most boring description of a incredibly dramatic industry ever written, belying Abarth’s Teutonic heritage. To help fund his racing program, Abarth soon began manufacture of a range of exhaust silencers tuned for specific cars, and thanks to high quality and good marketing, he soon employed over 40 people. 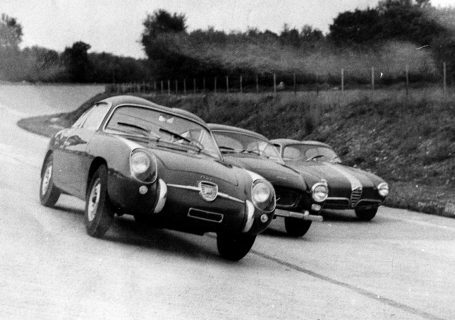 By the early 50s Carlo’s factory was supplying exhausts to Alfa, Maserati, and Ferrari. 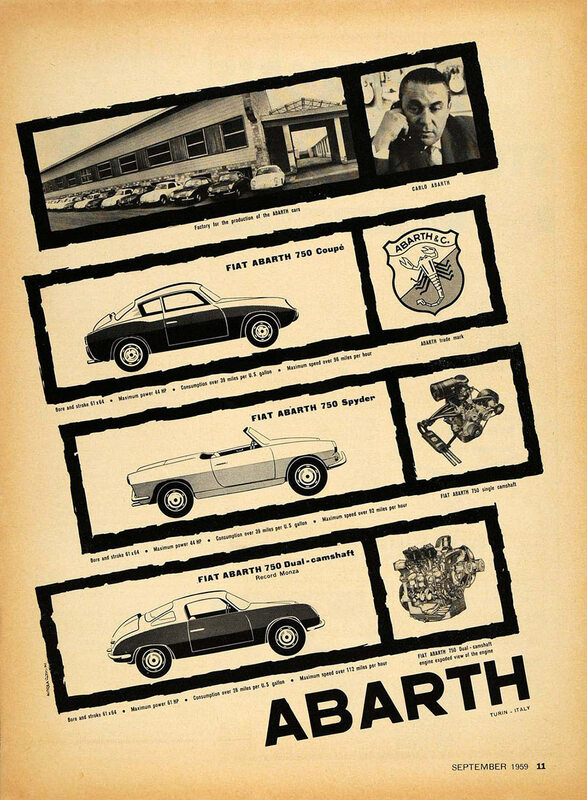 With 1955’s arrival of the Fiat 600, Abarth saw an opportunity to create a new, affordable sports car based on existing hardpoints. With a 750 CC motor more than doubling the standard car’s power, and two different, more aerodynamic bodies from Zagato, the resultant Abarth 750 and Abarth 750 GT punched far above their weight class. Shortly afterwards Abarth would offer a 750 conversion kit comprised of everything needed to turn a 600 into a mechanical clone of the Zagato-bodied cars, including tools, oil, and even chrome badging. 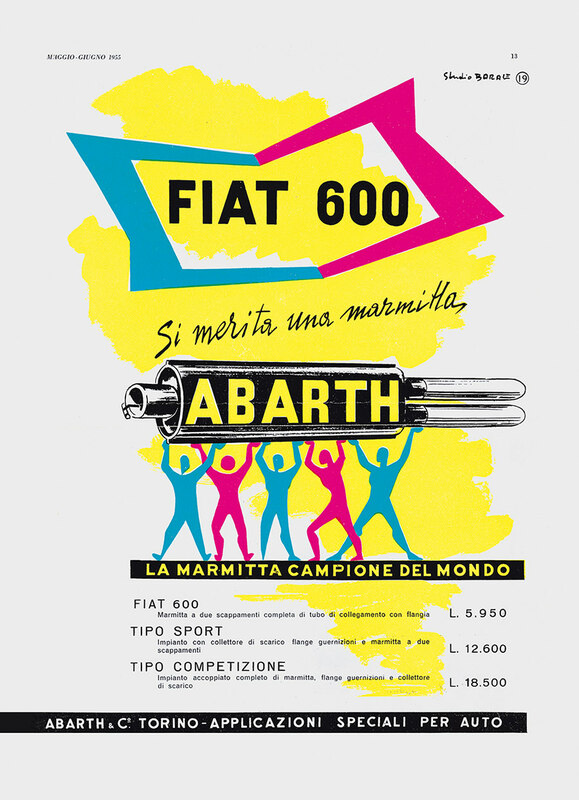 After a string of international victories, including a 1-2-3 class finish at the 1957 Mille Miglia, as well as an incredible run of speed and durability records, Abarth’s legend was already on a precipitous rise. 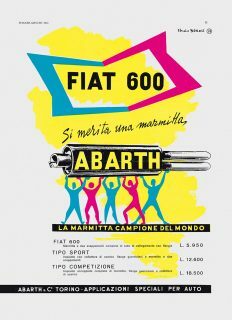 Throughout the 60s, 70s, and 80s, Abarth churned out victory after victory in nearly every major form of international motorsports competition, and the detailed histories of the many great race and road homologation models associated with these successes could, and has, filled volumes of books written by people far better equipped for the task than I am. So instead I’ll end on a hopeful note, supported by a recent test drive of a 2013 Abarth 500—in short it was stupid, childish fun, evoking memories of being a freshly licensed teenager as no other modern car’s been able to in a long time. 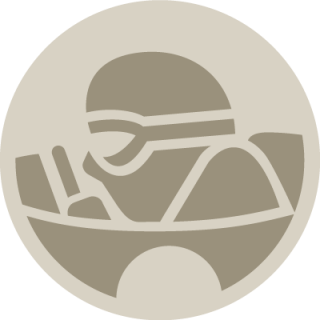 I’d go so far as to say it’s completely redeemed Abarth for their dark days as cynical badge engineers for a slew of uninspired, luke-warm efforts dating from the 1990s, the last time the badge was used with regularity. 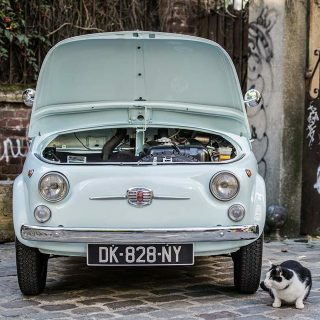 Reliability and a capacity for emerging rust-free from a light sprinkling may have replaced fun as a priority at Fiat, but as long as we have a rejuvenated Abarth, that’s a good thing. I can’t wait to see what happens next.